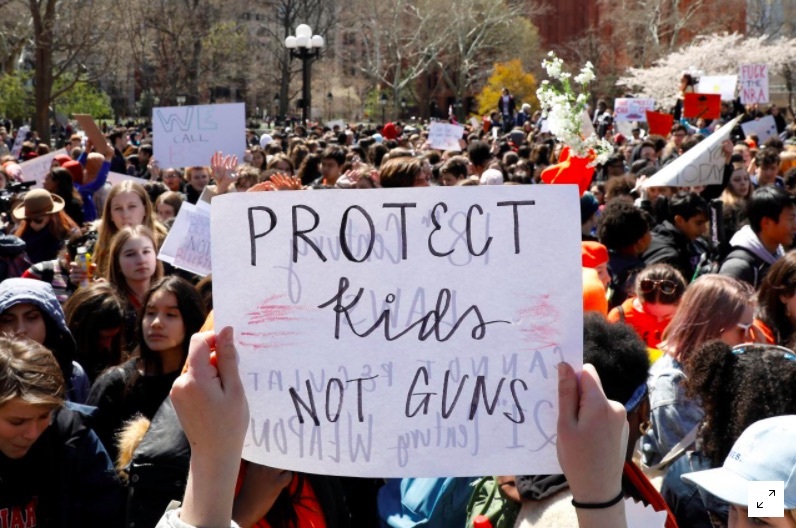 Leaders of the student-led anti-gun movement, who inspired classroom walkouts across the country on the 19th anniversary of the Columbine High School massacre, say they plan to maintain their activism through the long summer break. This week’s protests [on April 20] marked the second mass student walkout since a 19-year-old man opened fire at a Parkland, Florida high school in February, killing 17 people. It signaled the emergence of a growing national campaign led by young people to lessen gun violence and toughen laws on firearms sales. But the movement faces a major early challenge as the traditional three-month summer break approaches for most U.S. public schools at a critical moment in their bid to be heard by politicians in their home states and Washington, D.C.
“The reason why this has been so huge (is that) we’re in school, we talk to our classmates, we spread it around, everybody’s around so it’s kind of easier to show up,” said Vivian Reynoso, 17, a junior at Tucson High Magnet School in Tucson, Arizona, who helped organize rallies for both nationwide demonstrations in the past month. In the nearly two decades since Columbine seniors Eric Harris and Dylan Klebold went on a shooting rampage in 1999, killing 12 students and a teacher before committing suicide, school shootings have become almost commonplace in the United States. Students at Columbine, which has not held classes on April 20 since the massacre, did not take part in the walkout, and were encouraged to do community service instead. Even as students prepared for Friday’s protests wearing orange, the color of the anti-gun movement, news began trickling out that a 17-year-old student had been wounded in a shooting at a high school near Ocala, Florida, some 225 miles northwest of Parkland. The debate over guns in America, where the right to bear arms is protected under the Second Amendment of the Constitution, has raged nearly since the nation’s founding. The students hope to succeed where other activists have failed in enacting stricter legislation on gun ownership, either at the state or federal level. As anger fades over the Parkland shootings, the test for students will be in organizing for gun reform. Many of the protests featured voter registration drives, with students aiming to make it a major issue for midterm elections in November. “Who knows whether they maintain the energy or not but there are historic examples of student-led movements that have played an important role in moving things forward, (for example) the Civil rights movements,” said Adam Winkler, a professor of constitutional law at the University of California, Los Angeles. The March 24 “March For Our Lives” rallies in cities across the United States were some of the biggest U.S. youth demonstrations in decades, with hundreds of thousands of young Americans and their supporters taking to the streets. Friday’s walkouts, though smaller in scale, signaled the determination of the students to press on with their movement. “The way we’re viewing the summer right now is it’s really an opportunity to put in a lot of work on some really big plans we have going for the return to school in August,” said Gavin Pierce, 21, a college junior studying film in Los Angeles and an organizer of the “March for Our Lives” pro-gun control group. “Everyone is really eager to keep this going and to keep on organizing until we see real change,” Pierce said.